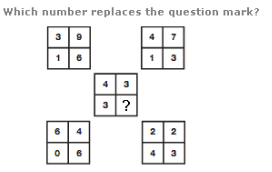 Reading each row of the diagram as a series of 3 digit numbers, the centre 3 digit number equals the sum of the top 2 numbers, and the sum of the lower 2 numbers. 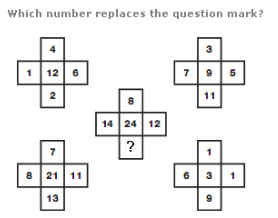 Add together values in corresponding positions of the top two crosses, and put the results in the lower left cross. Calculate the difference between values in corresponding positions of the top two crosses, and put the results in the lower right cross. Finally, add together the values in corresponding positions of the lower two crosses to give the values in the central cross. Start with the top left hand box, and move around the others in a clockwise spiral towards the centre. 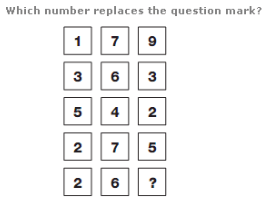 Read each box as a pair of 2 digit numbers, one above the other. The sum of the 2 digit numbers in each box follows the sequence 55, 60, 65, 70 and 75. In each group of circles, the centre number equals the average of the four surrounding numbers. Split the left and right hand circles in half, vertically. The sum of the numbers in the left hand half of the left circle appears in the top left hand segment of the middle circle, and the sum of the numbers in the right hand half of the left hand circle appears in the bottom left hand segment of the middle circle. Repeat this pattern for the right hand circle.